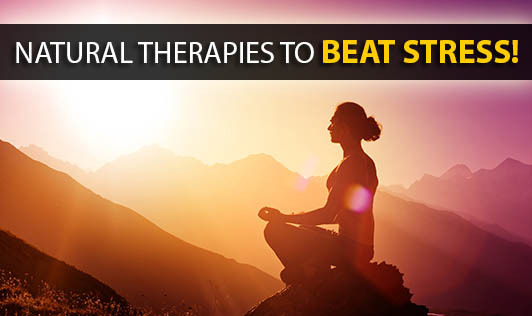 Natural Therapies to Beat Stress! The fast-paced lifestyle that we lead today has resulted in a generation of individuals with high anxiety. If you suffer from stress and spend most of your day being anxious, then skip those addictive medicines and give these natural therapies a try. These natural ways may help your body heal the effects of anxiety. • Acupuncture: This therapy generally leaves the person calm and relaxed and is an excellent way to reduce stress and anxiety. • Hypnotherapy: Stress and anxiety is successfully managed through a variety of hypnosis techniques. • Biofeedback: Being alert in your physical response to stress and learning to control them is a good therapy for those suffering from anxiety. • Polarity therapy: It is an integrated approach that includes soft touch and assessment of energy balance. This is often helpful for lowering stress levels. • Color therapy: This therapy involves the use of colors and light to balance energy. It is helpful in restoring balance and making a person calm. • Hydrotherapy:Relaxing in a hot bath with herbs and essential oils is an excellent way to relax and sooth anxiety. • Crystal therapy: Many people believe that certain stones have specific healing properties. Rose quartz is supposed to relieve anxiety. • Bio electromagnetic therapy:Magnetic and electromagnetic fields are manipulated and used as a source of natural healing. It has been successfully used to reduce muscle tension and anxiety. • Reiki: In this treatment, transfer of energy takes place from the practitioner to the client. This works to heal and aid anxiety. There are hundreds of natural ways to beat stress and anxiety. Avoid getting addicted to anti-anxiety medicines and try few simple ones that suits and works for you.